The LGBTQ Studies minor is designed to allow students to explore sexuality and sexual minorities from a variety of perspectives. The minor will provide students with an introduction to a broad array of LGBTQ issues, including visual and performing arts, literature, languages, history, social science, various theories, public policy and the law, families and other types of intimate relationships, crime, popular culture, and LGBTQ identities and communities. This widely interdisciplinary field addresses work in a broad range of scholarly disciplines, including biological and cultural studies, literature and anthropology, the health sciences, history, and the visual arts. It ranges from archival research to the elaboration of queer theory, from the analysis of constitutional law to questions of public health, from the study of popular culture to investigations into the development and social construction of sexual identity. A minor in LGBTQ Studies consists of at least 15 credits in LGBTQ Studies courses (requirements, core, and related courses, co-listed and cross-listed) with a grade of C- or better in each course and a cumulative GPA of at least 2.0 in LGBTQ courses. All minors must complete WGS 201: Introduction to Women's and Gender Studies and WGS 202: Introduction to LGBTQ Studies. The remaining course work must include at least 9 credit hours at the 300 level or above and no more than 6 credit hours in any one department or program. Student may not take more than 3 credit hours of individual studies without the approval of the program director. How are our lives shaped by gender? 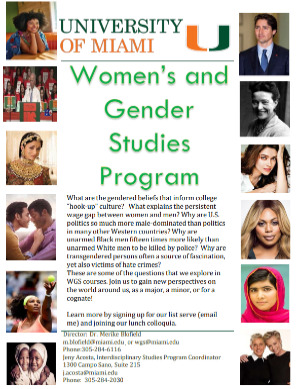 This course introduces students to the ways in which Women's and Gender Studies as an interdisciplinary field examines conceptions of masculinity and femininity; gender relations; gender inequalities; the intersections of gender with other categories of identity such as class, race, sexuality, and stages in the life cycle; and the broad impact of gender on society (including political, legal, economic, and religious arenas). As an introduction to the LGBTQ Studies minor, this class will be multidisciplinary, and will require challenging reading, engaged discussion, and on-going written responses. We will examine how contemporary sexual and gender identities have been historically, culturally, and politically constructed, how other times and places have thought differently about these forms of human variation, and how these ideas continue to be in transformation. We will think through some key current questions in contemporary queer global politics: should states recognize and regulate gender, and if so, how? Is gay marriage about equalty or assimilation? How should we nurture the autonomy and well-being of intersex people? How might the growing and vulnerable LGBTQQIAA population in the global south best be supported by those of us in the global north–and what might we have to learn from them? WGS 305: QUEER STUDIES (3 credits). This course examines gay, lesbian, bisexual, transgender, transsexual, and queer identities as they shape daily lives and experiences; the construction of alternative family structures; queer theory and its implications for our understanding of key issues across a range of disciplines; and current debates over the meaning and validity of sexuality as a way of understanding human sexual desire, emotions, and behavior. WGS 350: SPECIAL TOPICS IN WOMEN'S AND GENDER STUDIES (3 credits). WGS 450: SPECIAL TOPICS IN LGBTQ STUDIES (3 credits). All minors may choose to complete an individual research project with a faculty member of the student's choice; the student is responsible for finding an appropriate faculty member who is available to supervise the project and then must seek formal approval from the written report or research paper, the format of which will vary according to the nature of the project. POL569: POLITICS, LAW AND SEXUAL IDENTITY (3 credits). This course considers sexual politics by looking in depth at several issues including; restrictions on marriage, adoption, employment, military service, housing, and intimacy based on sexuality and/or gender identity. For each issue, we shall consider how the debate is constructed by politicians, academics, the media, LGBT activist organizations and law/legal theory. We will also contemplate the state and national politics at work within these issues. Finally, we will consider the topics from a comparative view as well as address the international implications arising out of that comparative consideration. In general, the goal is to learn about the current state of the politics of sexual identity in the United States and abroad. Moreover, students will engage frameworks through which politics might be assessed and determine the generalizability of the logics of politics. PREREQUISITE: POL 211 AND 212. POL 373 AND 374 RECOMMENDED. SOC 335: SOCIOLOGY OF LGBTQ COMMUNITIES AND IDENTITIES (3 credits). The course examines gender, race, age and class differences in the experiences of gays and lesbians. A life-span perspective guides the course after the presentation of some background of biological, psychological, and sociological theories pertaining to homosexuality. Prerequisite: SOC 101. STUDENTS MAY SELECT TWO APPROPRIATE AND RELEVANT COURSES IN ANY DEPARTMENT, IN CONSULTATION WITH THE DIRECTOR OF WGS.